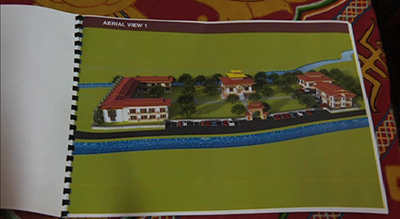 A Bhutanese temple and a guest house will be constructed for Bhutanese pilgrims in Rajgir, a notified area in Nalanda district in the Indian state of Bihar. This is to mark the golden jubilee for the establishment of bilateral ties between Bhutan and India. His Holiness the Jekhenpo awarded the seed money for the project to Chairperson of Steering Committee, the Former Chief Justice, Lyonpo Sonam Tobgye, yesterday. Including the seed money (Nu 1m), the Central Monastic Body and sponsors from business communities collected Nu 5m for the temple construction. Lyonpo Sonam Tobgye said, the Chief Minister of Bihar, Nitish Kumar granted two acres of land in Rajgir to the royal government to build a Bhutanese temple in 2010. The project is expected to start from November this year. Rajgir is the most visited pilgrimage destination by Bhutanese people.